- Win8 Pro and Seasonic X560 used here aren't listed in the 1150 test setup on pg 3. - Do you need Win8 for C6/C7 to work? If so, might be good to be definative about it rather than just saying Win8 is designed more efficiently in this regard. I hope to see (if not added here) an article on thermal performance! Thanks for all the detailed link & fact checking, Steve, all of which have been integrated into page 3. I'll let Larry respond to your second post about page 5. I would be interested in seeing some numbers on thermal performance. This is one area that really concerns me with Haswell, and hasn't gotten a lot of discussion so far in the reviews on most major sites (Anandtech, Tom's Hardware, etc.) Some sites discuss how thermal limits put a ceiling on overclocking, but so far the only discussion I've seen of thermal performance at stock speeds is on Legit Reviews, which found that the i7-4770K maxed out at a whopping 82 degrees C when using the stock cooler. I wonder how long the chip will last at those temperatures. Even if the wattage used appears to be lower, the increased thermal dissipation compared to Sandy Bridge and Ivy Bridge could be a serious problem for someone trying to design a silent system. Im also interested on temps only stock, no OC, vs the i7 3770k, to see if there is a need for more cooling on haswell but purely on stock. Yea i would echo what JDG1980 said about the thermals, i was surprised that most places are reporting that Haswell runs hotter than previous gen chips but there was no mention of this in the article. AFAIK, Haswell does seem to run hotter at load, if you can trust the accuracy of the thermal sensor in the CPU, and according to chats I've had with heatsink and other hardware makers in Taipei at Computex last week -- all of whom are referring to the readout of the internal CPU sensor, of course. We can certainly run the kind of stress testing we do for heatsink tests, but unfortunately there's no definitive way to thermally compare a Haswell to an Ivy Bridge -- incompatible sockets & motherboards. About the closest we can get to a true A/B test for temperature differences between CPUs of different sockets is to use the same HSF and the same fan speeds with the same loads... and measure the temp of the base of the heatsink using our infrared temp sensor. It'd be better with a surface-embedded thermocouple (on the top of the CPU casing or the bottom of the heatsink base), but that's a lot of work. ...but the flip side is that if you're running a silent rig, you're most likely using a big powerful cooler with a fan that's set to keep the CPU temp below a certain temp (let's say silent below 60, and always keep it below 70C). This is pretty easy with most motherboard fan controllers these days, so the question of longevity seems moot -- you'll upgrade to a new platform long before you have a chance to burn out the CPU. We are always told its faster for the Northbridge, Southbridge, Memory controller, integrating GPUs, and now the VRM's to be brought into the chip. But im starting to question the cost in thermal load of all these extras, especially when we are faced with the ever decreasing surface area of the CPU. last to avoid the area of the VRM--till you remove the lid. Replace the TIM with Coollaboratory Liquid PRO with the syringe it comes in. the VRM. Leave a thin even film over the CPU. Replace the lid. Put the CPU on the motherboard, etc., as usual. What are the relative sizes of the chips? The same or eve less heat when concentrated into a smaller area means higher temperatures. So the Die sizes have dropped roughly in line with the reduction in the Fab process. How big/expensive of a cooler do I need to strap onto that stock CPU in order to maintain an SPCR level of silence at a tolerable temperature? We know how well a variety of coolers respond with older CPUs. What we don't know is how that translates to Haswell with it's combination of higher power density and inferior IHS attachment. Maybe you could grab a few best-in-class coolers (using the reference fan) and use existing load tests on one mobo. I will throw this out there knowing that it's a beast of many parts...and that it could be trimmed down a lot. Here's the rough take. Hopefully, you'll get an Asus mobo in so you can use Fan Xpert to set fixed fan rpm...or Speedfan or whatever. By setting the fan to a fixed rpm, we can do a direct compare to the published cooler review and plot Haswell temps at given loads vs the cooler review results. This does add yet another test variable - fan RPM. Oops. Probably need to test each load at a couple of the published RPM levels for the reference fans. Like I said earlier, a beast of many parts. Temp measurements: How is Haswell temp sensing easier or harder than what's done for the cooler reviews? Is it that Realtemp/Speedfan aren't updated for Haswell? Is that the internal chip temp sensors aren't the most accurate things in the world (I've heard 5%)? In the end, it would be great to have an idea on how much cooler is needed for a specific build. Maybe my bucket list can be pared down to a reasonable test set. I'd be glad to help with presentation graph-fu. The RAM added for the Iris Pro parts is a separate die in the same package. 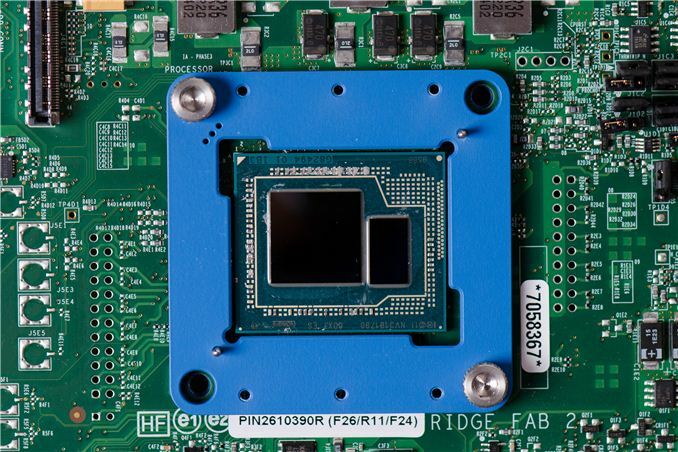 Here's a die shot via Anandtech. Until further test are done the best comparison we have is with IVB, and from everything i have read it seems Haswell runs cooler when idle but a fair amount hotter when under load. I borrowed this from another web site, they used the same heatsink for each test if it matters (NZXT Havik 140 cooler). Support for the attached Quick Sync transcoding engine is also starting to expand, though not fast enough for our liking. The addition of HandBrake, a free, open source encoding application, to its ranks makes the feature is more accessible but it still works best on the limited selection of "properly" supported commercial software, e.g. MediaEspresso. The problem with MediaEspresso is (at least the last time I checked) that you can't run it from a batch file/command line. My SageTV server can kick off a process when a TV show has finished recording that can transcode the MPEG-2 content to H.264, but in order to do this you need something that has a CLI. Luckily Handbrake comes with a CLI so it works but for a while there were only a couple of applications that supported QuickSync and neither of them were useful in this instance. Converting to H.264 reduces file size and makes the file iOS friendly. ...note, it's always good to site the source and/or provide the link. Thanks for the info...note, it's always good to site the source and/or provide the link. I'm interested in the i7-4770 R, which has the Iris Pro 5200 IGP, and 65W TDP. I've read this is an OEM chipset. Does anyone know if this will be sold as a stand alone retail product as well? so far the only discussion I've seen of thermal performance at stock speeds is on Legit Reviews, which found that the i7-4770K maxed out at a whopping 82 degrees C when using the stock cooler. According to this review at Muropaketti, stock cooler and default clock 4770k reaches 100C in a few minutes in Prime95 and starts to throttle to keep temps at 100C. So it's totally unusable with Intel cooler. I think any 14cm tower cooler with a slow spinning 14cm fan is good enough for 4770k. Currently I'm using old Prolimatech Armageddon with 14cm 600rpm Fractal silent series fan, and getting max 83C prime95 temp at 4300MHz, +0.001V offset. Lowest stable undervolt with default clock is 3900MHz, -0.140V offset, prime 68C. These low voltage settings should be usable when I upgrade to skylake/skymount/skylake-E, and move haswell parts to my htpc case (replacing 2500k) with noctua SE14 low profile cooler and gentle typhoon 800 fan. Retail version runs much hotter than engineering samples of 4770k. Don't trust any early reviews based on engineering samples, those are not valid reviews. Muropaketti's and likely also spcr review are based on retail version. Currently I'm using old Prolimatech Armageddon with 14cm 600rpm Fractal silent series fan, and getting max 83C prime95 temp at 4300MHz, +0.001V offset. Lowest stable undervolt with default clock is 3900MHz, -0.140V offset, prime 68C. Thanks for the OC and UV temp measurements! 0.14V offset is ~24% power delta...call it 20W less with Prime95. The irony here is your undervolted 4770K running at maybe 60W is about as efficient at removing heat as the 130W Nehalem used in SPCR's Armageddon review with a 680rpm 14cm Slipsteam fan. Great job, Intel. Well, what I had planned for my next build was to use a SilverStone Fortress FT02 case, run the three 180mm intake fans on low speed, and have the case fans as the only fans in the system - using a Thermalright Macho heatsink for the CPU, and an Arctic Accelero S1 Plus for the video card. Ideally, they should get enough airflow from the large fans at the bottom to keep cool. At least that was my thinking with Ivy Bridge. But with Haswell, this is probably no longer feasible. (I'm looking at mid-range Xeon processors - the E3-1230 v2 and v3.) Building a workstation like this would represent a large investment for me, and I'd want it to last 5 to 7 years - and Haswell runs so hot that I have my doubts about that. I'd prefer not to see load temperatures above 70 degrees. Could you not get one of the Haswell's with a lower TDP ? There are no Haswell Xeons with a TDP lower than 80W. I'd be surprised if that was indeed the case. Intel's rating are obviously not model-specific. Relying on them is foolishness. The slowest CPU of the same type with a given rating is sure to consume less (if there's more than one CPU with that rating). Even with the fastest CPU, you'd likely never come close the rating without overclocking. If you want a Xeon quad but would be willing to settle for one of slow models with a lower TDP rating, simply get the cheapest Xeon quad and underclock it if your tests show that it's needed in your build. Either way, you'll be fine. Underclocking is a perfectly reliable way of keeping a CPU cool. It's usually not needed but if you insist on an unusual cooling system, it might be prudent to underclock a bit. Maybe you could also turn off HT. Does that affect it's availability?